Our latest issue of Pure Nintendo Magazine is out now and features a number of great articles exclusively on the world of Nintendo! 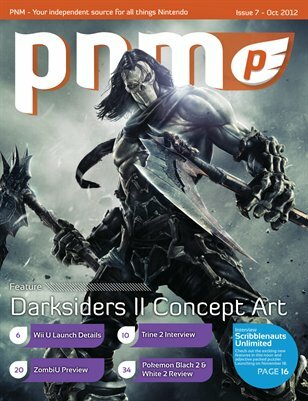 The cover story is all about Darksiders II's great concept art and exclusive screens for Argul's Tomb (Darksiders II expansion pack) which is included in the Wii U version. We go in depth hands-on with ZombiU and have 2 exclusive interviews for Trine 2: Director's Cut and Scribblenauts Unlimited for the Wii U. Also featured in this issue is the second Legend of Zelda Skyward Sword Heart Piece Walkthrough. Check out the history of Luigi including his origins and his many appearances in games over the years. It's our best issue yet! Let us know what you think by emailing us at magazine@purenintendo.com.